The Regent Palms is a 72-suite resort, featuring 1, 2 and 3-bedroom suites with balconies and terraces, most with ocean views. 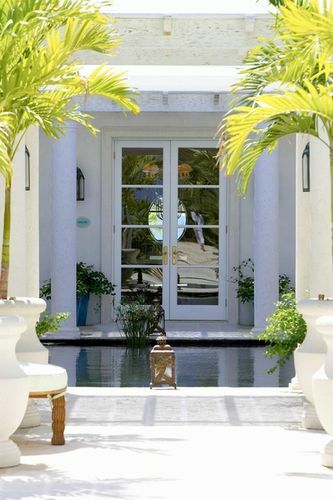 The resort is situated on world-famous Grace Bay Beach just steps from powder fine sands and azure waters. Marble floors, vaulted ceilings with milled crown moldings, wainscoting and custom-made mahogany furnishings lend a luxury residential quality. World-class amenities include the 25,000 square foot spa and two signature restaurants, Parallel23 and Plunge. We enjoyed the “cabana” chairs each day- and there always seemed to be plenty of the covered/shaded chairs for all the guests. The resort was primarily couples scattered with a few families with children. We had teenagers – which was fine since they were relaxing and diving most of the day. The service was Four-Seasons-ish, with cool/scented towels; water bottles and cold melon brought to us on the beach.